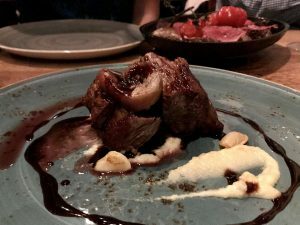 Set in the heart of the old town in Edinburgh, Monteith’s restaurant should be on every gluten free eater’s bucket list. With some of the friendliest and most professional service, a terrific wine list and some succulent Scottish food, it goes straight into my top ten. Kicking things off, we had some punchy little cocktails which is something this place is known for – some locals drop into the bar area just for a cocktail or a glass of the great wines on offer…. 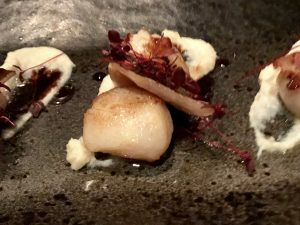 The menu, which focuses on high quality Scottish meat and fish in particular, includes scallops, sole, steaks, lamb and venison. It’s like a canter through Scotland’s produce, possibly aimed at visitors to the city and there is even a starter of haggis with mashed potato for those who want it. My starter of scallops and bacon had that wonderful combination of sweet and salty and looked beautiful, coming served as three little mounds of delight. Other starters on offer included some delicious liver parfait and the gluten-eating teenager enjoyed a mound of risotto with poached egg. We didn’t have the oysters on offer, but they looked pretty good too. Mains, which come with gorgeous looking chunky chips which the gluten avoiders sadly cannot eat (a minor issue with so much other choice), were all beautifully laid out and had punchy flavours. Lamb rump with a salty jus and lamb bacon was supplemented well with the roast potatoes – a good alternative to the non-chip eating situation. Salmon, lobster and sole are other options and everything just looked fantastic. There are a few nods to the vegetarian, but this is largely a place that just loves its meat and fish. All bread, vegetables and potato come as extra – so make sure you study those sides. As always for the coeliac, the pudding choices were not extensive – though what they had was good! There are some great cheeses from the excellent Mellis cheesemonger, a large plate of smoky chocolate mousse and some ice cream. The service at Monteiths really stood out for us. The immediate recognition and care around GF eating; the friendly smiles and helpfulness of our servers and just an overall feeling that we were welcome there. This is a place to put on your Edinburgh Fringe eating list. NB: since writing this review, I have received a report from another diner who didn’t have quite the same experience as we did. While it was during August that she visited, you may want to bear in mind when you eat at Monteiths that they do not serve GF bread and that some choices on the menu are not GF.